Research into flamingo behavior is limited due to the species’ secluded and fluctuate lifestyles all around the globe. Most of the research into flamingo’s behavior has occurred in the captivity setting. There are behavioral characteristics that researchers have discovered apply to most flamingo species. Scientists are just now learning some of the background causes for flamingo behavior. For example, flamingos are known for their one-legged stance. This has been correlated to the flamingo saving heat energy and also allowing one of their legs to rest. This is a necessary characteristic, especially of flamingos that spend long hours in cold water and high altitude climates like the Andean Flamingo. These birds generally spend their days feeding, sleeping, resting, bathing, swimming or migrating. When flamingos sleep, they rest their heads on their back. This requires the bird to turn their neck all the way around. Preening, waterproofing their feathers with oil, takes up about 15 to 30 percent of their daily routine. Flamingo who aren’t breeding tend to follow a nocturnal feeding schedule, they feed at night, whereas breeding flamingos will eat at day or night or both. The non-breeding flamingos sleep mostly during the day or bathe. Flamingos also prefer to travel at night to avoid predators. Flamingos are also vocal birds. The variety of sounds that flamingos can produce varies from breed to breed. For example, the American Flamingo can grunting softly or produce a deeper growling if alarmed or frightened. Flamingos are social birds meaning they stick together in colonies or flocks. Flamingo flock sizes ranges from a few birds to a few hundred to tens of thousands of birds. The average flock size is roughly about 100 birds. 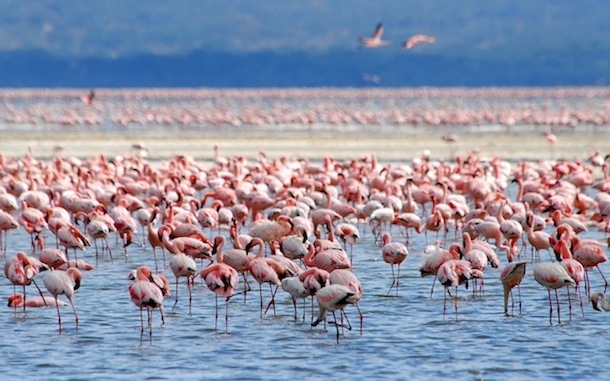 Small flocks are rare because flock size is a big advantage flamingos have over predators. Flamingos in small flocks have a high chance of being successfully attacked by a predator. Because of varied diets among flamingo species, two or more species of flamingo can co-habituate in the same area. For example, the Lesser Flamingo prefers a diet of shrimp and algae. When it is mating season, the flocks separate into smaller mating flocks. These flocks of flamingos participate in mating rituals simultaneously. The rituals can include a mixture of head and wing movements or a single act such as the head flagging, marching, the wing salute or the wing leg stretch. In the head-flag movement, flamingos turn their head from one side to another. The marching ritual can be described as a group of flamingos walking in synchronized directions. Flamingos are monogamous with their mate and they stay together while laying one egg per year. Males and females work together to search for the nesting ground. They help each other construct the nest and they protect it from enemies and other flamingos that want the site. Flamingos are often unique as they feed their young crop milk. Both males and females produce a secretion called milk. Flamingo young who grow up in the flock are provided with the safety of the flock. After they are one week old, they can leave the nesting sight and venture about on their own. They can practice flying and often achieve flight a couple months after birth. The chicks form their own groups called crèches. Chicks who stray from the group are faced with the threat of predators.